MINERVA, Ohio — PH&S Products has taken one of its most popular gloves and improved it with a safety indicator. Intercept Free is a nitrile exam grade glove used in the first responder market. Previously an all-white glove, it now features a bright green interior. 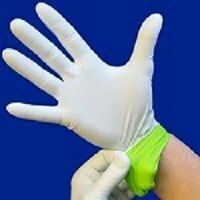 The purpose of the green interior is to show the wearer when the glove has been compromised by a cut or a needle prick. Safety of the wearer and the patient were the driving force behind this improvement. Intercept Free is an 8.25 Mil in the fingertip glove with a 12” length for extended protection. This powder free, single use ambidextrous glove is made of a nitrile compound and not made with natural rubber latex. PH&S tested this glove for use with Chemotherapy drugs as well as against heroin and fentanyl exposure by world renowned laboratory, Akron Rubber Development Laboratory. Intercept Free is an accelerator, sulfur and zinc free glove that meets or exceeds NFPA standards. If you would like more information about Intercept Free 2 Tone, please call 330.868.2239 or e-mail us at sales@phs-products.com. PH&S Products, an ISO 9001 (with design) certified company, is a leader in design and development of innovative hand protection for municipal government agencies, emergency response teams and other public health and safety providers. All glove styles are manufactured to the strictest quality standards and we also offer NFPA certified gloves. Customers are assured of quality service provided by our knowledgeable customer service team. Request more product info from PH&S Products.